Young people from across the UK will once again have the opportunity to produce a range of anti-racism themed artwork; creative writing, film and music in order to take part in Show Racism the Red Card’s annual school competition. As part of one of the most prestigious competition’s for schools in the country, young people can build on the anti-racism work developed in school by producing a piece of work designed to help promote a strong anti-racism message to adults and other young people alike. Once again, this year's competition has recieved some fantastic support from a range of sponsors including the Professional Footballers Association, The National Union of Teachers, UNISON and Potts Printers. 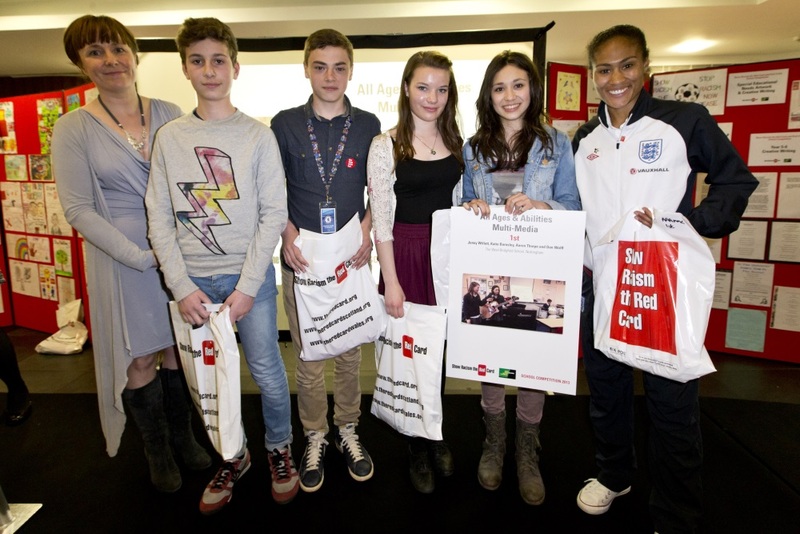 All the winners of the SRtRC School Competition - England 2014 will be invited to receive their prizes at a special Awards Ceremony, in a Premier League Stadium. The prizes will be presented by special guests including current and former professional footballers and winners will be able to take in a tour of the stadium as part of the event. Last year’s competition generated no fewer than 53 winners, all of whom took part in a spectacular awards ceremony at Chelsea F.C’s Stamford Bridge Stadium where prizes were handed out by special guest of honour Rachel Yankey; England’s most capped player of all time. Schools looking to be involved must register their interest by 28th February 2014 and all entries must be submitted to Show Racism the Red Card by 14th March 2014. Schools must not submit more than one entry per category, per school. Click here to download the entry from and further information on the 2014 School competition. Stay tuned to the Show Racism the Red Card website for further announcements on the competition, the venue for the awards ceremony and the special guests in attendance.